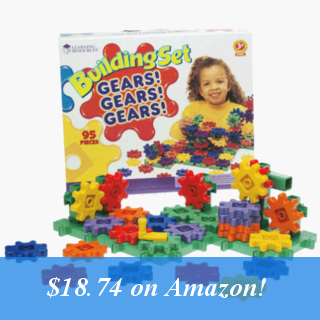 Let your kids experiment with science and simple mechanics with the Gears! Gears! Gears! Set. The set is on sale for $18.74 which is the best price I’ve seen. It’s $29.95 regularly, and $28 at Wally World. I saw it on ChristianBooks.com for $20.49 but shipping adds $5.99. The set will ship free from Amazon for Prime users or anyone with an order over $35.